The GVP-24-2L-LV-SOL-MS from Larson Electronics is a Vapor Proof Solar Power LED light fixture that is the ideal lighting solution for remote areas and standalone applications where connection to external power is either impractical or unavailable. This powerful yet compact vapor proof LED light delivers crisp, clean light while reducing operating costs. Charged by the 30 watt solar panel, two 12V AC 8aH sealed lead acid batteries provide constant, reliable power to the 2 tube, 28 watt fixture. 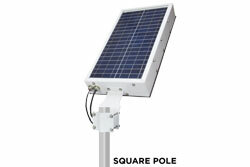 The GVP-24-2L-LV-SOL-MS ships with a convenient 10` of 16/3 SOOW cord connecting the solar panel to the light fixture which allows operators to position the panel where the most ambient light is available. This vapor proof LED solar power light is also equipped with a motion sensor that turns the light on when movement is detected. The motion sensor is installed inside the light fixture for superior versatility and effectiveness. Light Features: This 2 foot long, 2 LED tube, vapor proof solar LED light fixture is ideal for use in remote locations requiring powerful yet compact LED lighting. The GVP-24-2L-LV-SOL-MS features our second generation LED T-series 14 watt T17 style lamps which produce 15% more illumination at 8 feet as compared to standard T8 lamps when measured with an Extech light meter. Our LED-T series bulbs are visibly brighter than standard T8s and have consistently surprised many of our customers with their unexpectedly high light output levels. We have eliminated the ballast box normally associated with fluorescent fixtures which reduces overall weight, creates a slimmer unit profile, and helps this LED fixture maintain a T-6 temperature rating. The solid state design of the LED lamps gives this fixture superior resistance to damage from vibrations and extremes in temperature as well as a lamp service life over twice that of standard T8 bulbs. Charged by the 30 watt solar panel, two 12V AC 8aH sealed lead acid batteries provide constant, reliable power to the 2 tube, 28 watt fixture. These batteries are contained within the solar panel, not the light. The GVP-24-2L-LV-SOL-MS ships with a convenient 10` of 16/3 SOOW cord connecting the solar panel to the light fixture which allows operators to position the panel where the most ambient light is available. 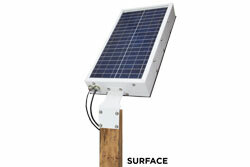 The solar panel is equipped with a motion sensor which is designed to turn the light on when motion is detected. The day/night and motion sensor is programmed to active the solar panel in the evening and to shut it off during the day while the motion sensor will activate the panel upon detecting motion. The motion sensor is installed inside the light fixture and not on the solar panel. This allows the motion sensor to be the most useful to operators. The fixture should be mounted at heights between 10` and 20` for the motion sensor to perform at peak levels. The motion sensor covers an area of 15` by 15` when mounted at 16` in height. The GVP-24-2L-LV-SOL-MS provides 10 hours of continuous runtime when the battery is fully charged. Charging time for the battery bank is 5 hours when exposed to direct sunlight. As with all solar powered equipment, charging time is affected by the amount of available ambient light. Indirect sunlight and low ambient light levels, such as on cloudy days, will extend the charge time. LED Benefits: Unlike gas burning and arc type lamps that have glass bulbs, LEDs have no filaments or fragile housings to break during operation and/or transportation. Instead of heating a small filament or using a combination of gases to produce light, light emitting diodes (LEDs) use semi-conductive materials that illuminate when electric current is applied, providing instant illumination with no warm up or cool down time before re-striking. Because there is no warm up period, this light can be cycled on and off with no reduction in lamp life. LED lights run at significantly cooler temperatures than traditional metal halide and high pressure sodium lights and contain no harmful gases, vapors, or mercury, making them both safer and more energy efficient. No extra energy is wasted in cooling enclosed work areas due to external heat emissions from bulb type lights, and the operator risks associated with traditional lighting methods, such as accidental burns and exposure to hazardous substances contained in the glass bulbs, are eliminated. Solid state LED lighting is also safer for the environment as LEDs are 100% recyclable. And recycling simultaneously reduces operating costs by eliminating the need for the expensive special disposal services required with traditional gas burning and arc type lamps. Power/Wiring: This GVP-24-2L-LV-SOL-MS is powered by two 12V AC 8aH sealed lead acid batteries that are recharged by a 30 watt solar panel. These rechargeable batteries provide a continuous supply of steady, reliable power. The lead acid battery pack is contained within the solar panel, not the light. This fixture ships with 10 feet of 16/3 SOOW cord that connects the light fixture to the solar panel. Custom lengths are available upon request. Please contact us for special requirements. 6. A wrench is used to unscrew the end caps for relamping the fixture, while some competitive models require the end tap and knock offmethod to loosen the end cap.